OPOC has launched a new wizard help tool which guides users through 6 simple steps to set-up your first project. If you’re a small company or a large enterprise, OPOC has been built to cater for almost any size company, in any business sector. Unlike a lot of our competitor’s systems, we welcome new users to try and see for themselves how easy we've made remote data collection. We're always improving our user experience, and we're happy to announce the launch of our new wizard help tool. Now anyone can experience OPOC and give it a try, just click the ‘Get started’ button on our website. Once registered, all new users are presented with five simple steps to create their first project. 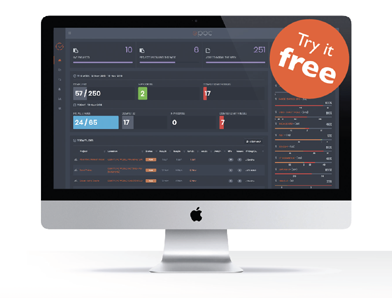 These simple steps allow a new user to become comfortable with the OPOC system and provide a platform to trial OPOC live. When inside the OPOC control centre, our helpful wizard will highlight the main controls within the system. When your chosen field agent starts to answer the RFI;s you will see the information, arrive in the control centre almost instantly. Watch Videos, look at high quality photos, see location markers, and read through comments and notes.